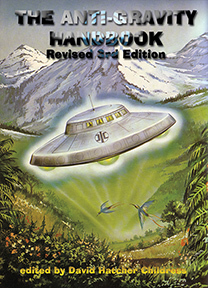 The new expanded compilation of material on Anti-Gravity, Free Energy, Flying Saucer Propulsion, UFOs, Suppressed Technology, NASA Cover-ups and more. Highly illustrated with patents, technical illustrations and photos. This revised and expanded edition has more material, including photos of Area 51, Nevada, the government’s secret testing facility. This classic on weird science is back in a new edition! Includes: How to build a flying saucer; Arthur C. Clarke on Anti-Gravity; Crystals and their role in levitation; Secret government research and development; Nikola Tesla on how anti-gravity airships could draw power from the atmosphere; Bruce Cathie’s Anti-Gravity Equation; NASA, the Moon and Anti-Gravity; The mysterious technology used by the ancient Hindus of the Rama Empire; The Rand Corporation’s 1956 study on Gravity Control; T. Townsend Brown’s electro-gravity experiments; How equations exist for electro-gravity and magneto-gravity; Tons of patents, schematics, photos, cartoons and other illustrations! •How to build a Flying Saucer. •Arthur C. Clarke on Anti-Gravity. •Crystals and their role in levitation. •Secret government research and development. •Nikola Tesla on how anti-gravity airships could draw power from the atmosphere. •Bruce Cathie’s Anti-Gravity Equation. •NASA, the Moon and Anti-Gravity. •The mysterious technology used by the ancient Hindus of the Rama Empire. •The Rand Corporation’s 1956 study on Gravity Control. •T.Townsend Brown’s electro-gravity experiments. •How equations exist for electro-gravity and magneto-gravity. •Tons of patents, schematics, photos, cartoons and other illustrations! ---- ---- This new edition has even more patents and diagrams than ever!